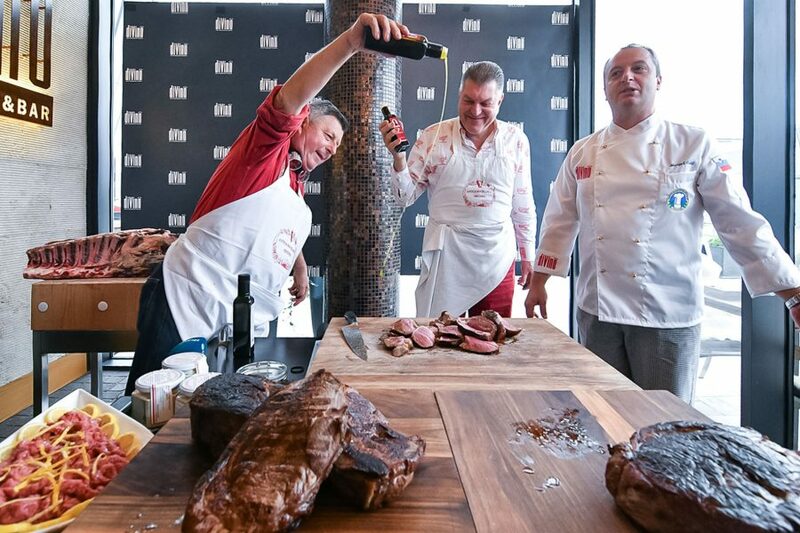 Dario Cecchini and diVino are setting new gastronomic milestones • BTC d.d. 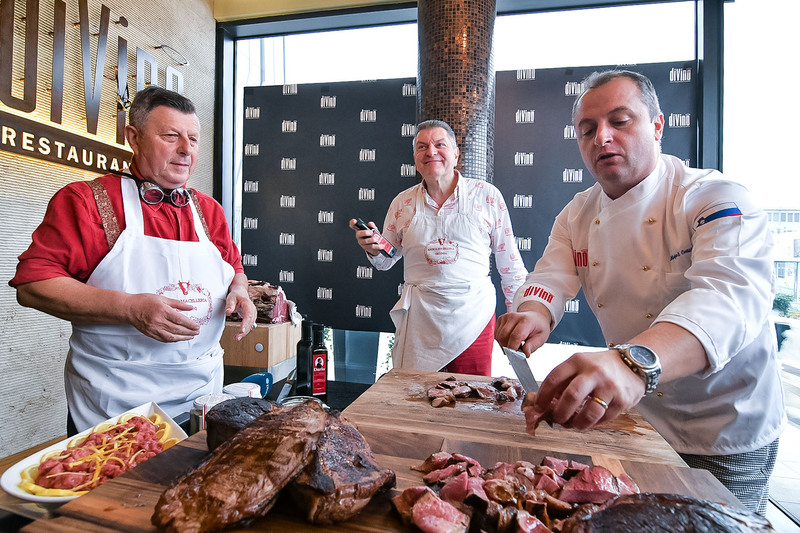 Specialities made by Dario Cecchini have reached worldwide renown due to the distinct method of preparing meat, which is based on sustainability and respect towards animals in particular and nature in general. From now on, you can also try them in Slovenia, specifically in restaurant diVino in Ljubljana’s BTC City. 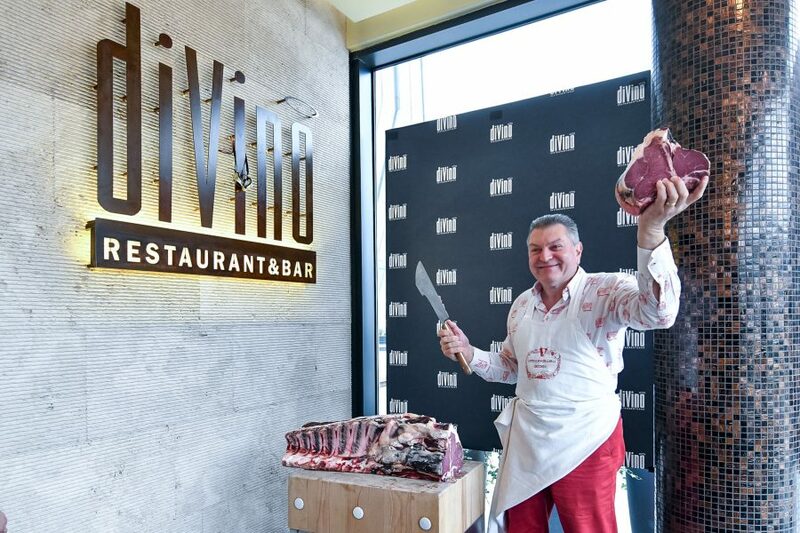 DiVino will dedicate every Wednesday evening to the enchanting atmosphere of Tuscany and the so-called “Cecchini Show”, which propelled the magical chef from the small Tuscan hilltop town of Panzano to fame. 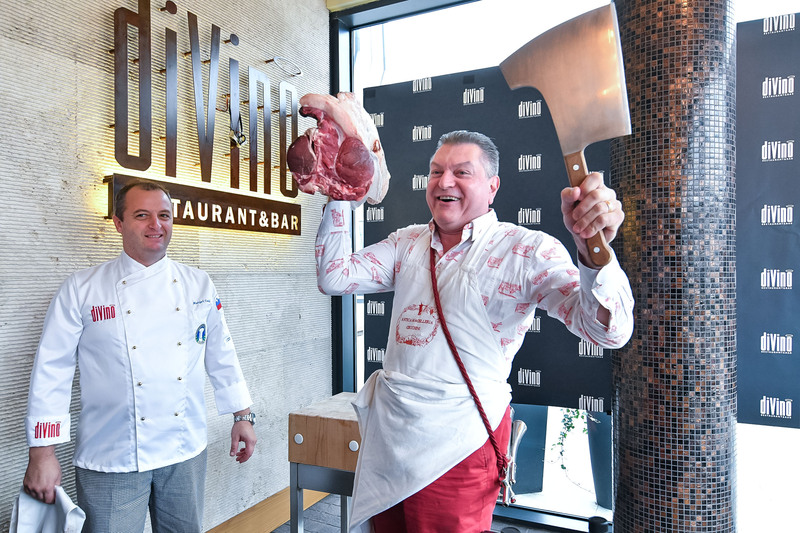 At a press conference in Ljubljana, which was attended by many representatives of Slovenian and Italian media, Cecchini said that his experience spanning 45 years is based on a 200-year-long family butchers’ tradition. This tradition is based on respect towards animals, providing them with enough room for pasture, good food, and generally above standard rearing conditions with a completely different approach from the one employed in mass production. 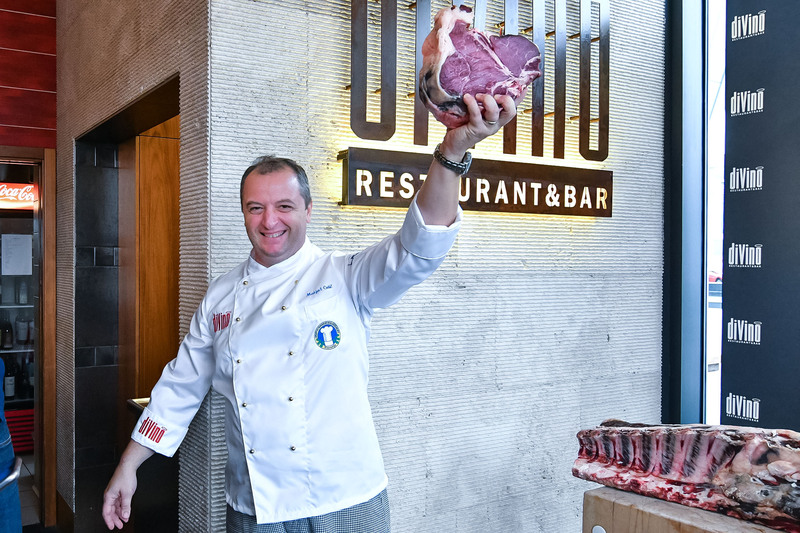 “My philosophy is simple, it is about the art of butchery,” stressed Cecchini. The delicious flavour is enhanced by a variety of additions, also made in-house. Everything is natural and local, which is a recipe for success, he said. 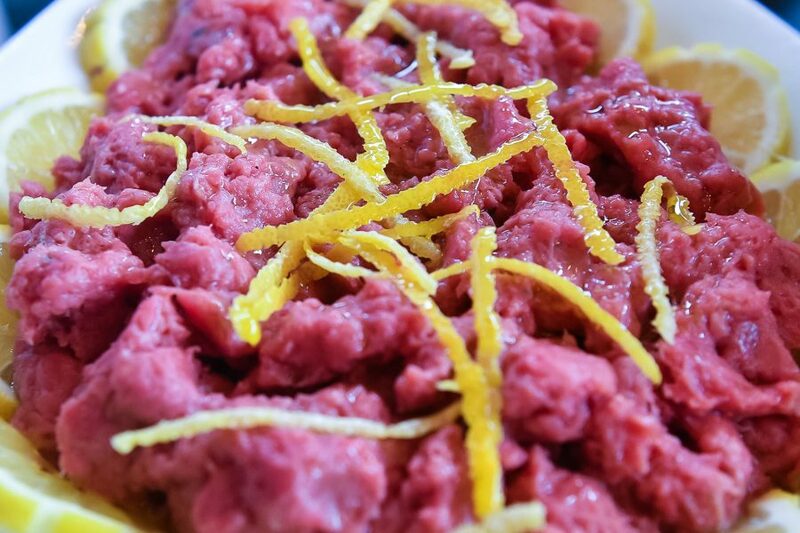 “Antica Macelleria Cecchini is a small family enterprise, which is why we carefully select our partners, who need to be good at what they do and should understand my work and philosophy. This is why we have chosen restaurant diVino. We have already worked with their team for an entire year, in order to provide our customers only with the very best,” said Cecchini. He emphasised that he decided, after careful deliberation, that diVino will be his home in Slovenia. “I feel at home here, and to Slovenia I bring the message of my family, the message of friendly relations with the Slovenian people,” he added. The head of restaurant diVino, Julija Krenker, stressed that it is a great honour to be working with one of the greatest masters of gastronomy in the world. The franchise, which they acquired as the only ones in the country and the broader region, enables them to prepare Cecchini’s products according to his own homegrown method – a new and innovative approach in world cuisine, with which diVino’s chefs acquainted themselves at trainings and practical demonstrations under the guidance of Cecchini and his colleagues. The cooperation with Cecchini adds value not only to our restaurant but also to Slovenia in general, which, justifiably so, places particular emphasis on its cuisine and aims to become a prime European site of excellent cuisine. To present Slovenia as an elite culinary destination is precisely what the Slovenian Tourist Board has been striving for. Its head of research, Barbara Zmrzlikar, said that Slovenia was among the first in Europe to adopt this decision, that is, in 2006. This proved to be the right move, since it brought about numerous achievements. Among other things, Slovenia won the title European Region of Gastronomy 2021. 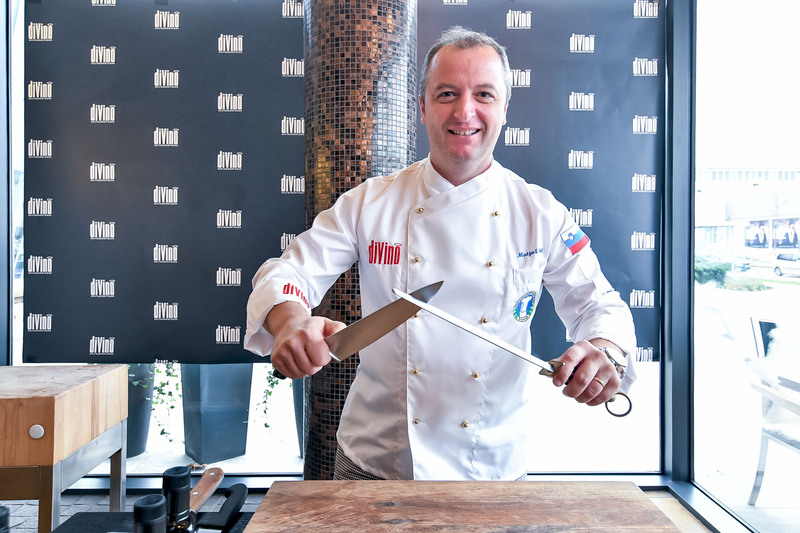 The Slovenian vision in the field of gastronomy is similar to Cecchini’s. “We want to offer high-quality ingredients, produced locally and respectfully toward nature, tradition, and all the givens provided by the Slovenian natural environment,” said Zmrzlikar. 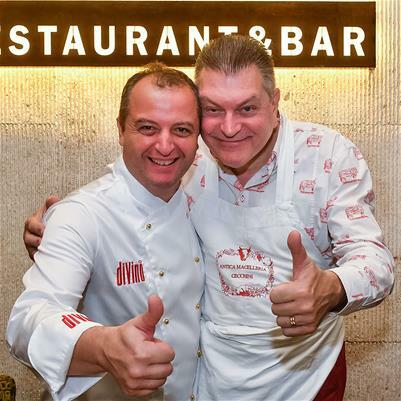 The partnership between Cecchini and diVino shows how it may all be combined, which is praise-worthy, added the representative of the all-Slovenian tourist organisation. 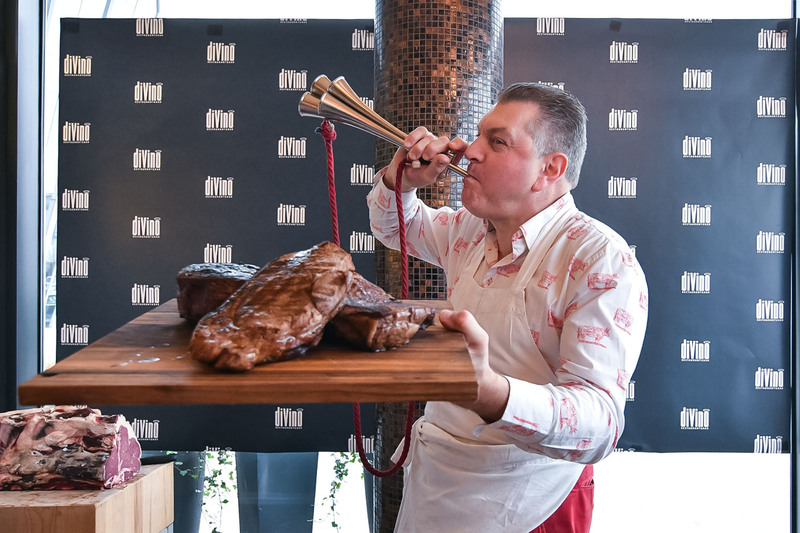 “To ensure adequate quality mandated by Cecchini, the staff of diVino attended more than one hundred hours of education and training sessions. 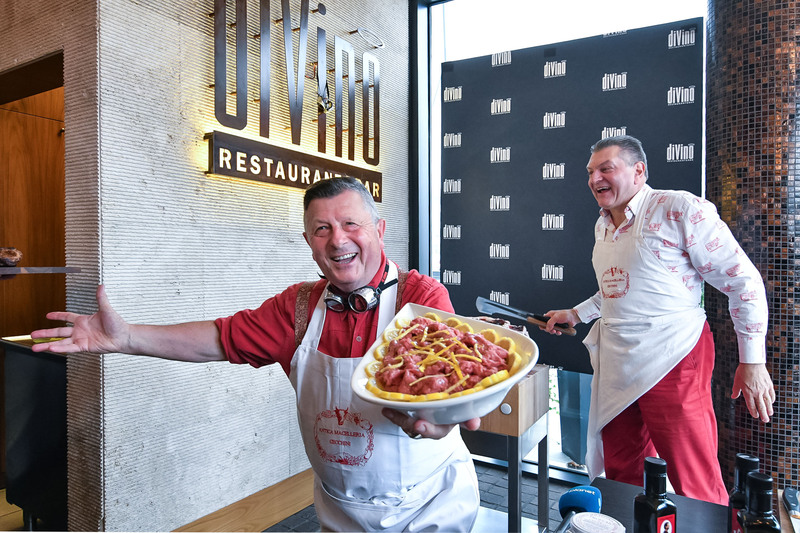 We also paid a visit to Cecchino in his hometown,” said diVino’s principal chef Matjaž Cotič. 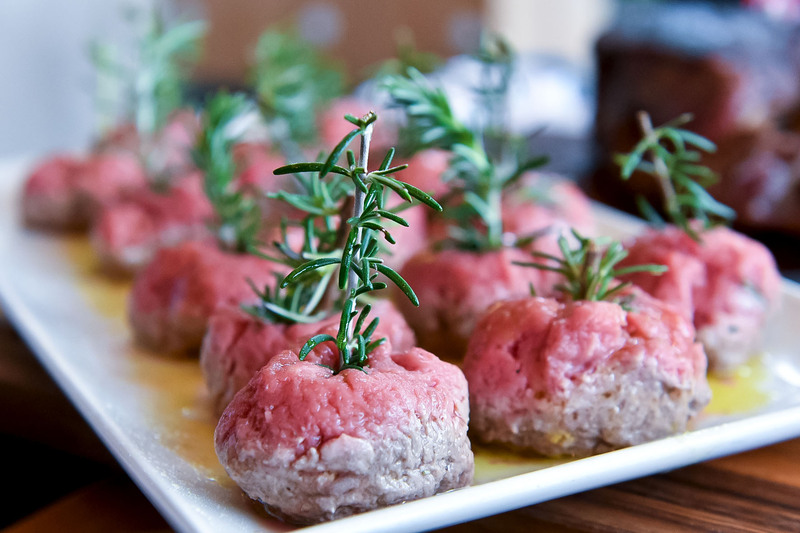 He added that the master from Panzano inspired them with his philosophy and approach to meat preparation. 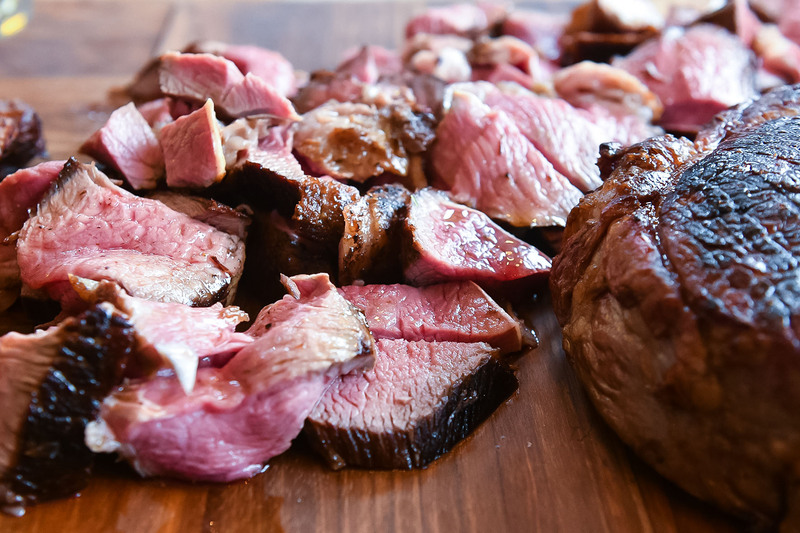 “The meat he prepares is truly exceptional, prepared with heart, and that is why it tastes so good,” he stressed. Where there is good food, there must also be good wine. This is why diVino will present Cecchini’s masterpieces together with a new line of wines from Kleti Brda, named after the last owner of castle Dobrovo, count Silverio de Baguer. As stated by the head oenologist of Kleti Brda, Darinko Ribolica, wine has always been a part of food and tradition. With their line of white and red wines De Baguer, which is a result of their cooperation with the former owners, they want to make a return to wines that are an excellent complement to cuisine. “Following our tenets of bringing together tradition and the contemporary moment, we want to provide this brand of wine only to select, meaning the best, restaurants on the market, which includes diVino. We think that this wine is appropriate for those places that have the best food,” he emphasised.